Well, you cannot have a UNIQUE constraint WITH NOCHECK, because these are actually unique indexes and these need to be checked. I had this problem where 2 columns were suppose to be a unique combination, and after quite some years, discovered that, who would’ve guessed … there are duplicates. We couldn’t just rush to delete data and add an unique constraint but we had to stop duplicates being added. Msg 1505, Level 16, State 1, Line 2 The CREATE UNIQUE INDEX statement terminated because a duplicate key was found for the object name 'dbo.duplicates' and the index name 'UQ_duplicates'. The duplicate key value is (1, 2). Msg 1750, Level 16, State 0, Line 2 Could not create constraint. See previous errors. The statement has been terminated. The CREATE UNIQUE INDEX statement terminated because a duplicate key was found for the object name 'dbo.duplicates' and the index name 'UQ_duplicates'. The duplicate key value is (1, 2). This way, i dont need to delete all duplicates right away, and I can evaluate the 3rd column in my table – specific_value – to see which one is correct and remove the duplicate. Msg 547, Level 16, State 0, Line 1 The INSERT statement conflicted with the CHECK constraint "UQ_duplicates_with_function". The conflict occurred in database "TestDb", table "dbo.duplicates". The statement has been terminated. 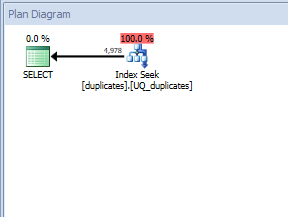 The INSERT statement conflicted with the CHECK constraint "UQ_duplicates_with_function". The conflict occurred in database "TestDb", table "dbo.duplicates". My unique constraint is an index and I can see an INDEX SEEK operator on it. This approach, with using a function in a check constraint, can be handy in many scenarios, not just this one, for example to validate complicated input or to validate data against other tables. thanks dude, your work to publish this is very much appreciated, it helped me a LOT.